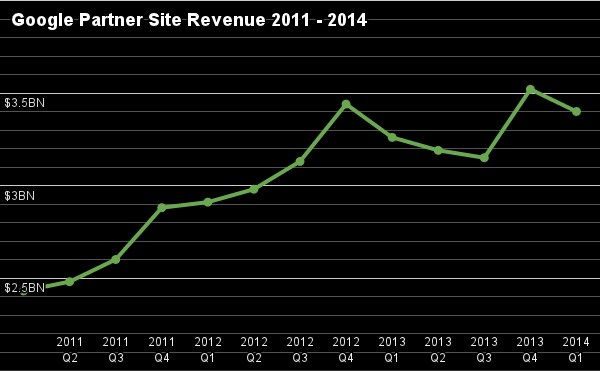 For the first three quarters of 2013 growth of revenue from partner sites through the Google AdSense program completely stagnated and revenues actually shrunk. Things looked a little better for the last quarter of 2013 and the first quarter of 2014, but industry pundits and analysts see it as a disturbing downward trend. As we enter the Post-PC era, we are seeing PC screens getting replaced by smartphones and tablets. At the end of 2012, I predicted that the inventory of PC screens available for Google ads would be declining over the next ten years, using the rate of decline of dial-up users as a model. It’s hard to predict the rate of decline and equally difficult to obtain hard data on the number of PC screens in use, but according to IDC, in 2013 PC shipments dropped by 9.8 percent, their steepest-ever decline. Google has reported declining value from clicks on its ads. And the shift to mobile ads is accelerating the decline, because it produces a fraction of the revenue of desktop ads. — Tom Foremski Analysis: What’s the future for Google’s plunging $12.7bn AdSense business? This would suggest that the shift away from traditional Desktop and Laptop PCs would account for at least some of the declining revenues for Google. In Google’s Q3 conference call with analysts, CFO Patrick Pichette shrugged off the declining revenue as a result of Google’s own “advertising policy changes” by which one presumes they mean removing partner sites that weren’t complying with Google’s terms and conditions, e.g. producing fraudulent clicks, etc. In my earlier analysis, I suggested that 2016 may be the year where the impact of these shifts really start to appear in Google’s earnings. It’s too early to tell if these recent dips in Adsense growth are an early indicator of the start of a bigger trend or, as Google argues, just a blip.